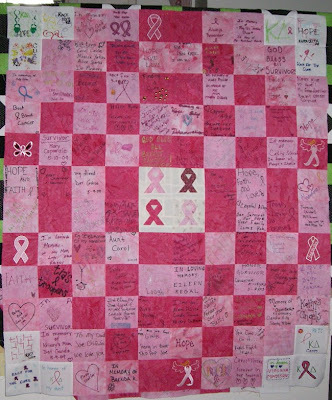 I was able to layout and assemble the second Breast Cancer Warrior Quilt over the weekend. I never know what design I'm going to do since in each sorted package of blocks there are different numbers of light pink from dark pink. I spend most of my time reviewing each of the blocks and reading the messages. There are so many that just touch my heart. I must have 4-6 quilt tops hanging on the banister ( I mean my built in quilt rack ;) when you enter my home. They are starting to blend into each other when I try to take photos. But, it just make me smile when I enter the home. They are also great conversation pieces when people enter. Especially the breast cancer quilts. Everyone loves reading the messages. I'm already thinking of all the bordering and backings and quilting I have yet to do. Just one step at a time. The quilting will be a basic stitch in the ditch since there are several beads and rhinestones here and there. I'll try to stitch something in the borders possibly. I am almost completed with the embroidered blocks for the third quilt. They are my contributions to the quilt. Plus, a few extra blocks are needed for each quilt to make the 10 x 12 blocks size and I just hate adding blank ones. If you have a message you would like added to one, email me and I have room for a few messages on the blank ones added. Oh that looks really wonderful ^_^!